Continuing our walk, Further down Nottingham Road …. Needlemaker Benjamin Tatham married Sarah Hardy in August 1822 and the couple had at least ten children. Sarah died in June 1845, aged 45, a week after giving birth to the last children, twins Joseph (the elder by thirty minutes) and Isaac, who both died shortly after their mother. Benjamin was therefore left with a family of seven children – the eldest Edmund had married and left home – with ages ranging from 19 to five years. From the time of the baptism of his first child at St. Mary’s Church in 1824 Benjamin is described as a ‘needlemaker’ and appears as such in Pigot & Co’s Directory of 1835 and in the 1841 census — and all subsequent censuses in which he appears. In 1871 he was at 73 Nottingham Road. 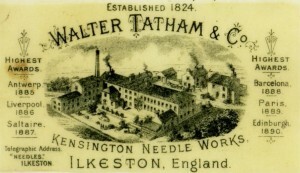 His firm ….. in January 1963 the Ilkeston Advertiser announced that the 139-year-old needle-making business of Walter Tatham & Co., believed to be one of the oldest established firms in Ilkeston, was to close down at the end of that month. It had been founded in 1824 and for almost 108 years had been run by the Tatham family until in 1932 it was taken over by the Marriott family. The firm was founded by Benjamin Tatham as ‘the first needle manufactory at Ilkeston’. (Trueman). The Advertiser of 1983 noted that a lace-making side of the firm had operated since 1859 though Sheila Mason writes that this had started by 1841 and probably as early as 1824. After Mr. (John) Cope retired or died came Edwin (Edmund) Tatham. Edmund and (his brother) Amos Tatham acquired the business, Edmund living in the old house against the factory with his family, Agnes, Walter and Ted. The eldest child of Benjamin and Sarah was Edmund — whom Adeline sometimes refers to as Edwin. He married his first wife in January 1844. She was Elizabeth Wheatley Burgin-Richardson, eldest surviving child of South Street blacksmith Robert and Mary (nee Wheatley). With his father, Edmund worked as a needlemaker at their Kensington site. By 1869 he had bought a lace warehouse in Nottingham and later, in the 1870’s, moved to Addison Street in that city with his wife and most of his children. Adeline mentions three of Edmund’s children though there were at least six others…..
— The first child, unnamed, was born three weeks after the marriage and lived only one hour. — …. as did Agnes (born April 1848) after her marriage in 1868 to Nottingham clerk John Saywell. — Walter (born February 1851) does not appear to have left Ilkeston, even after his marriage in 1876 to Alice Amelia Roberts, the daughter of Nottingham lace manufacturer Henry and Caroline Amelia. He died at Hillside, Nottingham Road, in November 1926, aged 75. — The 1871 census describes Robert as an ’idiot’. He died in Nottingham in 1876, aged 23. — Ted Tatham, Edwin’s son, married his first wife, Lavinia Flint, daughter of a farmer, of Gallows Inn. His second wife was Lizzie Goodacre, also a farmer’s daughter. We shall meet son Edmund Tatham junior alias ‘Ted’ shortly, at the bottom of Nottingham Road. — Elizabeth Ann died in December 1859 after six weeks of life. — Elizabeth Jane lived in Nottingham with her parents, and then with her step-mother. Edmund’s wife Elizabeth died at the Addison Street home in Nottingham – number 19 Addison Villas — on November 2nd 1876, aged 50. Edmund married again and on the 1881 is listed at his Addison Street home with his ‘wife’ Mary, aged 58, a native of Hallam, Nottinghamshire. SOLVED …… The answer is Mary Smith (nee Green) born abt.1823 HALAM (Nr. Southwell, Notts.) died 1891 Nottingham. Children to Samuel b.1784 [Oxton] (Orston) & Sarah Green b.1779 [Halam] of Halam, Notts…..
1910-1911 Wright’s Directory – Publicans George Samuel Green, Duke of Newcastle Arms, 68 North Sherwood St. The Will of Charles Smith late of the town of Nottingham, victualler, who died 26 Jan 1877 was proved at Nottingham by Mary Smith, widow. – Effects under £1500. No wonder we could not find it, why Yorkshire? Perhaps they felt guilty marrying so soon after spouses’ deaths. Edmund died in Addison Street on March 4th 1887, aged 62. And five months later the trustees* of his will put up for sale the Needlemaker’s Arms Inn in Kensington Street, then occupied by Edmund’s brother Herbert. In July 1862 B(enjamin) Tatham left the partnership of B(enjamin), E(dmund) and A(mos) Tatham, needlemakers. In the late 1860’s the firm was split when Benjamin’s son Amos moved into Belper Street initially as a needlemaker but then adding lace making in the 1870’s. Elder brother Edmund remained in Nottingham Road as a needlemaker while also acquiring a lace interest in Nottingham. In February 1872 Edmund Tatham’s oldest son Walter celebrated his 21st birthday and to commemorate the occasion a party was organised at the Kensington Works for the family and about 100 employees of ‘Edmund Tatham, lace and needle manufacturer’. The Pioneer reported at the time that “we are glad to hear that the lace and needle business at these Works is in a most flourishing condition, and affords employment to so many inhabitants in the vicinity”. About 1877/78 the same Walter Tatham bought the needle-making/machine-making side of the business. And in April 1878 the Nottinghamshire Guardian announced that the firm, sited at Kensington Works, Ilkeston, and 13 Castle-gate, Nottingham, was “despatching to the machinery department of the (Paris) Exhibition a beautiful case containing a complete collection of hosiery and warp needles, guides, hooks, points, &c., manufactured by them. The case is ornamented with designs of gilding on a black ground, and above it the name of the firm, with a view of the works at Ilkeston, is beautifully illuminated. The needles and other implements, highly finished, are arranged upon a bed of black velvet, and form a very striking design”. At the same time (1877/1878) Edmund’s other sons Edmund junior and Allen, together with Joseph Newsome Milne, had formed Tatham Brothers of Ilkeston and Nottingham, lace manufacturers. Meanwhile Edmund Tatham senior carried on business as a lace manufacturer in Nottingham. One Saturday night in March 1881 a window pane on the ground floor of the Kensington Works was broken, allowing a hand to reach into the office, open a desk drawer which was close by, and remove from it a bag containing £5 17s 9d. This money was the sick club fund, employees paying 3d per week into it. As the money had not been placed there before, an inside job was suspected. In 1881 Walter formed a partnership with Mansfield-born needlemaker Phillip Ellis to become Tatham, Ellis & Co. In 1891 this became Walter Tatham & Co. Shortly after the death of Edmund senior in 1887 ‘Tatham Brothers’ (that is, Edmund junior, Allen and Joseph Newsome Milne) amalgamated his business with their own and became Tatham & Co. In May 1889 Edmund junior retired from this firm and made over his interests to his two former partners — trading as Tatham & Co., lace manufacturers of High Pavement, Nottingham, and Kensington Works, Ilkeston. Copy of a Trade Card c 1891 (courtesy of the Ilkeston Reference Library). Benjamin’s second son Amos was born in Ilkeston in 1826 and married Eliza Bell, eldest daughter of William and Phoebe (nee Riley) at St. Mary’s Church in May 1847. After the birth of their first child Herbert in September 1848, the family went to live in Crich for a few years. In 1854 Amos Tatham and his family came to Ilkeston. By 1855 Amos and Eliza had returned to Ilkeston with two additional children, William and Eliza, in time for the birth of daughter Sarah. Amos Tatham and family lived in a house at the top of Park Road. The houses have been pulled down and a garage built on the site. They next moved into a house on the west side of Nottingham Road. When Edwin Tatham left the town in the (early)-mid sixties, Amos and family moved into the old house against the factory, and again, when Edwin returned to Ilkeston in the early seventies, Amos bought a piece of land in Belper Street, (on the east side), on which he built a small factory, and a house. They went into the lace trade, and ultimately increased their building. Amos worked in the family business until the firm split in the late 1860’s. The lace manufacturing partnership with his elder brother Edmund was dissolved in 1869 and in that year Amos established separate premises in Belper Street. By 1871 he had a house and factory on the east side of that street and the census of that year records him as living at 6 Belper Street as a needlemaker employing 29 men, 13 boys and four girls. In January 1871 Amos and his son Herbert, of Belper Street Works, applied for a patent for ‘improved means of taking up the threads in warp machines, and in the construction of points for such purpose’. When they wanted to extend the factory the house was pulled down and another one built in Stanley Street. In the later 1870’s Amos expanded on the west side of Belper Street, now a hosiery, lace and needle manufacturer, before he died in Belper Street in May 1878, aged 51. Amos’s sons Herbert and William continued the firm’s growth until the former died in London in 1882, following surgical treatment in his throat, leaving brother William to continue the Belper Street expansion. In 1884 warehouses and offices were built on the west side of Belper Street while a four-storey factory was erected on the site of the former house, by which time the family residence had been moved to Stanley Street. During the building work for these new premises excavations were made for a large deep cellar, leaving the gable end of the old workshops unprotected, unsupported and only half a brick thick. About nine o’clock one evening a large part of the wall collapsed into the cellar, damaging some machinery and valuable cardboard patterns of lace, and causing some consternation among the local populace. The children of Amos and Eliza…. 1] Herbert, the eldest, married Helen Sudbury, the youngest sister of the first Mayor of Ilkeston. Herbert was earlier encountered with the Sudburys of South Street when he had married Ellen Sudbury, youngest child of hosier and glover Francis and Ann (nee Mather) in September 1869. From the commencement of the firm of Amos Tatham and Sons, hosiery, lace and needle manufacturers in the 1870’s he was one of its most active partners and as his father became frail and ill he took over the main control, expanding the business in Ilkeston, Nottingham and Melbourne. At the beginning of December 1875 Herbert had employed Harriet Turner, aged 19 — daughter of agricultural labourer Henry and Mary of Balderton, near Newark — as a domestic servant to his household. About ten days later she was out during the Sunday afternoon of December 12th with her sweetheart and returned about 4pm. Half an hour later Herbert rung several times for Harriet to serve tea without success — so he called for Harriet and then went to look for her. Eventually a little before 6 o’clock she brought in tea — over an hour later than usual — complaining of a headache. She said that she would not be attending chapel that evening. After tea a young man came to visit her and left about 8pm, shortly before Harriet retired to bed. About two months later Alonzo Spencer, stationary engine driver of 44 Park Road and also employed by Herbert as a groom, was emptying rubbish from his master’s piggery. There he spotted an old biscuit tin, inside of which was a bundle containing the body of a female child, wrapped in some old cloths and pieces of newspaper. In the evening the police and Dr. Robert Wood were called and the body was examined, enquiries were made and these led to Harriet being arrested the following morning. By that time she had moved out of the Tatham’s house and was employed by Bath Street tailor and outfitter Edwin Sutton, living on his premises. She was charged with “unlawfully and of her malice aforethought, killing and murdering a female child, whereof she had just been delivered”. At the subsequent Coroner’s Inquiry in February 1876 evidence was heard from several witnesses including Alonzo’s wife Caroline (nee Brakes) who stated that she had discussed Harriet’s pregnancy with her. Superintendent of Police (Smalley Division) John Hancock testified that he had interviewed Harriet in the lock-up at the Town Hall where she had confessed to cutting her daughter’s throat with a carving knife just after her birth and after the baby had cried out. Surgeons Robert Wood and Henry George Brigham were both of the opinion that the child was alive after birth and that death was due either to a loss of blood from an untied umbilical cord or a wound to the throat. The Coroner was now confident that the case presented few difficulties — he was sure that the admissions of the prisoner, corroborated by witness evidence, would lead the jury to arrive at a just decision without any further remarks on his part. After 15 minutes’ deliberation the Coroner’s jury unanimously returned a verdict of wilful murder against Harriet. Harriet’s trial was at Derby Crown Court in March 1876. Her defence case centred on the suspect nature of Superintendent Hancock’s interrogation and the conflicting medical evidence over whether the child was born alive and had subsequently had a ‘separate existence’ from her mother. Had Harriet murdered her child while it was alive or had she merely concealed the birth? Swayed by the arguments of the defence, the jury returned a verdict of guilty but only of concealment of a birth, an offence which could often vary in degree and thus in importance. The judge pointed out that sometimes the case might warrant a very mild sentence as it is one rather for pity than for punishment. In this case however he considered it to be as near to murder as it could possibly be. Consequently he sentenced Harriet to 18 months imprisonment with hard labour. At the same court, at the same time, for concealment of a birth, Elizabeth Bennett of Buxton received three months hard labour while ‘deaf and dumb’ charwoman Mary Jane Bunting of Ashover was found not guilty of a similar offence. For some years Herbert suffered from a serious throat and chest complaint which eventually led him to seek the advice of Sir James Paget and the relief of an operation performed by Dr. Lennox Browne, assisted by Dr. Llewellyn Thomas, (both founders of the Central London Throat, Nose and Ear Hospital in 1877) in London in November 1882. Initially this seemed to be a success but then his health once more deteriorated and within three weeks Herbert was dead…. at 44 Devonshire Street, Portland Place, London. His body was brought back to his mother’s home in Belper Street before being buried in Ilkeston General Cemetery. His coffin was carried to his grave by employees of his company. At that time Herbert was senior partner in the firm of Messrs. Amos Tatham & Sons, Belper Street Works, and Chairman of the School Board. The local press judged him as a shrewd, pragmatic and successful businessman, a caring and sympathetic employer, and a genial, warm and witty friend. Herbert displayed energetic zeal in affairs of the Free Methodist Church and at various times acted as circuit steward, superintendent of the Sunday School, and President of the Young Men’s Class. In politics he was a staunch Liberal, someone who would fight his corner vigorously but never hold a grudge against those who opposed his views. He was one of a group which had established a Liberal Association in the town. He was also a one-time member of the Local Board and had been elected to the first two of the School Boards in 1878 and 1881, on the second one serving as Chairman. He was deeply concerned in all local educational matters but took particular interest in the development of the schools scheme at Kensington. Just over ten years after his death, in 1893, Herbert’s widow Ellen married widower and colliery manager William Holding. 2] William married Elizabeth Ann Carrier, eldest child of Bath Street grocer and draper Joseph and Jane (nee Attenborough) in September 1875. Trueman 1 points out that “William received his commercial education in Paris, where he studied the French language from 1867 to 1870”. “The firm of Messrs. Amos Tatham & Son, of which (William) is the only surviving partner, obtained the highest medals given for superiority of machine needles at the last International Exhibition held at Paris, and at the Troyes Exhibition; and were also awarded a silver medal by L’Académie Nationale of France, of which (William) is a member”. Both William and Elizabeth Ann died at Stanley House, Stanley Street – in June 1913 and May 1933 respectively. 3] Eliza married William Green, a schoolmaster. Six weeks before the marriage of her brother William, Eliza married William Skevington Green, eldest child of South Street shoemaker and grocer William and Eliza (nee Skevington). Eight months after her marriage Eliza died in Belper Street, aged 24. 4] Sarah married Arthur Sudbury, eldest son of William Sudbury, butcher and farmer, of Oak Well Farm. And in the same year Sarah married butcher and farmer Arthur William Sudbury, nephew of Ellen Sudbury, the wife of Herbert Tatham. 5] The other son died before reaching manhood. Arthur Amos – or Amos Arthur as he was registered — died at the Stanley Street home, unmarried, in April 1893, aged 30. Apart from Edmund and Amos, Benjamin and Sarah Tatham had eight other children. In Ball’s Yard we met eldest daughter Sarah Ann who married lacemaker and later pork butcher Thomas Ball in 1859. Her sister Maria married Alexander Cordon in July 1853. He was a framesmith and manager at Amos Tatham & Sons. They spent the latter part of their lives at Orchard House in Nottingham Road, and Maria died there in March, 1894, aged 62. Eliza lived as a spinster, all her life spent in Nottingham Road, and died at number 283 in November 1928, aged 95. Herbert married in March 1856 to Martha Bamford, daughter of Common blacksmith Thomas and Sally (nee Wheatley). Both died at their home at 37 Graham Street in October 1899 and March 1902 respectively. Mary was a Tatham who managed to ‘escape’ from Nottingham Road when she married engine fitter Theodore Richardson in November 1857 and moved to Derby. Benjamin junior was born, lived and died in Nottingham Road – the latter event at number 283 when he was aged 78. One of this Benjamin’s sons was also named Benjamin, born in March 1875…. ACCIDENT AT ILKESTON. – Yesterday morning a young man named Benjamin Tatham, son of Benjamin Tatham, was at work at the lace factory of Mr. Edmund Tatham, Kensington, Ilkeston, when by some means he was drawn up to the shafting of the machinery, and whirled round until his clothes gave way, and he fell to the floor. Strange to say, with the exception of a broken arm and a good shaking, the lad received no further injury. (Nottingham Evening Post – Thursday 20th. Dec. 1888). Born in June 1845 the twins Joseph and Isaac survived only a few weeks. Just over five years after the death of his first wife, Benjamin Tatham senior married his second wife in July 1850. She was born Ann Scattergood in 1807, the daughter of lacemaker Thomas and Mary (nee Gorse) and had married needlemaker Joseph Hardy in February 1837. Less than two months after the death of ‘much respected’ Joseph, aged 42 – in June 1850 — his widow married Benjamin and the pair lived together in Kensington for the next 20 years.